Volcano Watch: Tephra deposit names – out with the old, in with the new! 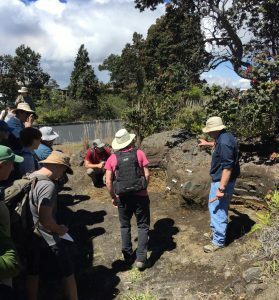 USGS geologist Don Swanson (right) explains Keanakāko‘i Tephra stratigraphy exposed near the Hawaiian Volcano Observatory to scientists who visited Kīlauea during a Geological Society of America field trip in May 2017. USGS photo by T. Neal. Sometimes you just have to sit down and do it. Everyone is faced with this challenge at one time or another and scientists are no exception. Our research into the explosive history of Kīlauea Volcano came to just such a head earlier this year. The name Keanakāko‘i was used, because good outcrops of the deposits are found near the crater of that name in Kīlauea caldera. That name was first applied to the tephra deposits 80 years ago, and it has utility today when geologists are speaking in general terms about that period of time. 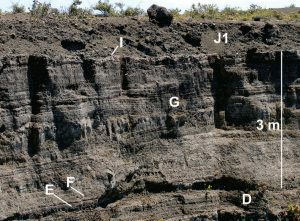 But the Keanakāko‘i Tephra contains many deposits, each of which was produced by a different eruption or a series of back-to-back similar eruptions. To study such specific eruptions, the term Keanakāko‘i Tephra is too general. What’s more, the variety in types of explosive activity is broad and of great importance in unraveling what happened and how it happened. Keanakāko‘i Tephra is thus a wastebasket term—useful as a wastebasket, but we geologists really want to know what is in the basket. We’ve limped along, using colorful terms for some of these subdivisions of the Keanakāko‘i. 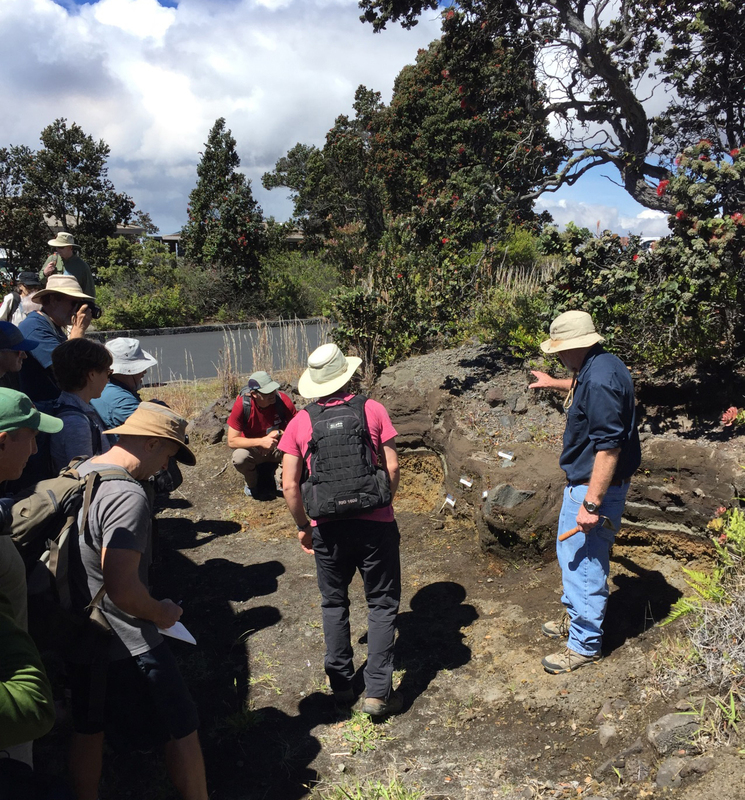 Names such as “mystery unit,” “footprints ash,” “layer 6 scoria,” “basal reticulite,” “golden pumice,” “eastern pumice,” and “unit H” have become the beloved jargon of the in-group studying the Keanakāko‘i. These names may never go away completely, but as more scientists tackle research issues in the Keanakāko‘i, a more systematic nomenclature became desirable. Something had to be done to clean up the mess. Example of the Keanakāko‘i Tephra sequence exposed on the southeast side of Kīlauea Volcano’s summit caldera showing some of the identified units labeled with the revised nomenclature scheme. USGS photo by D. Swanson. A University of Hawaiʻi at Mānoa professor and a USGS Hawaiian Volcano Observatory geologist reached this conclusion during lunch while attending a geophysical meeting in San Francisco last December. They decided then and there to do something about it. Pooling their expertise, the UH and HVO scientists developed a new nomenclature that is simple and reflects the various processes that formed the different deposits. They couldn’t use geographic names, as is the norm in geology. There simply aren’t enough suitable names around the caldera for what ultimately became a 12-unit classification, with some of the units subdivided still more. Instead, they opted for a nomenclature that instantly allows a beginner to tell which of two units is the older. The units range from A to L, in order of decreasing age. Unit A was erupted in about 1500 and the four subdivisions of unit L (themselves in temporal order, L1 to L4) in the early 1800s. Letters, rather than numbers, were used to avoid confusion with an earlier numbered nomenclature that never really took off. There’s been predictable pushback: the new terms lack color, are too hard to remember and too disruptive to old thinking, are not descriptive (as if “mystery unit” or “unit H” is descriptive!). But c’est la vie, that’s life. We think that, once the shock is over, the new nomenclature will make things easier for future researchers. Eruption style and intensity that produced the Keanakāko‘i Tephra are exceptionally diverse for a basaltic shield volcano. The new nomenclature takes this diversity into account. The boundaries between units conform to important changes in eruption style and, commonly, to different directions the explosion debris was dispersed. Maps of the different units show that their vents moved around in the caldera, sometimes shifting locations hundreds of meters in only a few years. Varying mixtures of steam from heated groundwater and volcanic gas powered many of the explosions, steam alone powered others, and at least four explosions were probably driven by volcanic gas only. The caldera was a dynamic place during the 300-plus years just before written history began at Kīlauea (in 1823), and the newly defined subdivisions of the Keanakāko‘i Tephra help us understand this energetic and dangerous time better than did the previous terminology. So, out with the old and in with the new!